Welcome to this Spring edition of the Beaconsfield Banner for 2018. The Banner is available on the BPA website www.beaconsfield.org.au and on mobile phones. In addition printed copies are available at the Post Office, Beaconsfield Community Complex, local businesses and it is displayed on the Community Noticeboard. I hope you enjoy reading the Banner continuing to inform residents on what is happening in Beaconsfield. The Digital Memorial Interactive Touchscreen for the Beaconsfield Honour Board and World War I soldiers was officially opened on Friday 31st August by Jason Wood member for La Trobe. Special thanks to the Committee members and IT consultant Barry Hyde for the work done on the project. The project has been mostly funded by a Grant from the Commonwealth Government Department of Veterans Affairs (see more details). Thank you to Midway Group for providing afternoon tea. The new Interpretation Sign for Bowman’s Track on the corner of Janet Bowman Boulevard and O’Neil Road at O’Neil Oval was also officially opened on Friday 31st August by the Cardinia Shire Deputy Mayor Cr Brett Owen. BPA worked with Janene Vurlow and Cr Brett Owen for a well designed and accurate information sign (see more details). BPA has been planning for future events for Beaconsfield and has been successful in obtaining Cardinia Shire Council Grants for the Australia Day 2019 Family picnic and outdoor movie night and the Anzac Memorial service on Sunday 21 April 2019. Further details will be provided in coming months. BPA is also working with Beaconsfield Baptist Church for the Annual Carols by the Creek Sunday 16 December 2018 – Remember to save the date. Geoff Lockwood Manager of Beaconsfield Reservoir Nature Reserve will be speaking about the future of the Reservoir at BPA’s AGM on Tuesday 16 October. Hope to see you there (see below for more details). BPA continues to advocate for improved parking at Beaconsfield Railway Station and we are supporting Cardinia Shire Council in their efforts to undertake parking surveys over the next 4 months for streets and roads near to the railway station and advocating more on-site parking at the railway station. The Beaconsfield Banner is produced by Committee members on a voluntary basis to provide community articles of interest. If you have any enquiries please email banner@beaconsfield.org.au or mail to P. O. Box 217 Beaconsfield Vic 3807. For more details see the Correspondence section of the Beaconsfield Banner. Beaconsfield Progress Association Inc. is the voice of the community and is always willing to advocate on township matters to Councils, Government and Government Authorities. Your input would be appreciated. Meetings are held on the 3rd Tuesday each month (excluding January) at 7.30pm at the Beaconsfield Community Complex and all are welcome to attend. 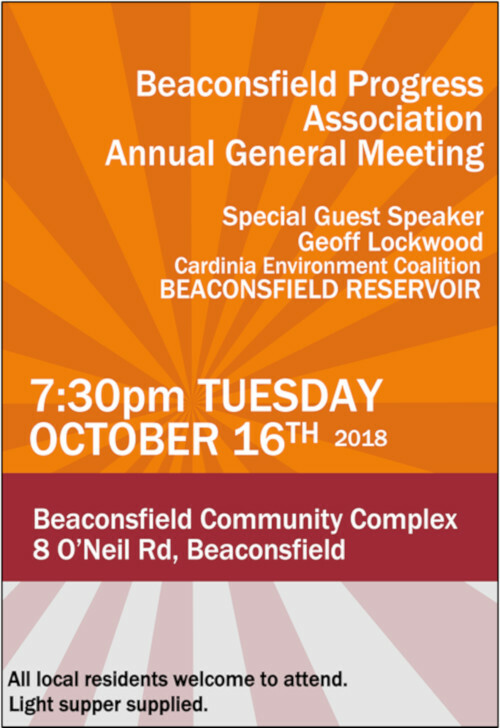 Geoff Lockwood Manager of Beaconsfield Reservoir Nature Reserve will be the guest speaker at the BPA AGM Tuesday 16 October 2018. The future use and accessibility of the Beaconsfield Reservoir Nature Reserve has been the subject of much discussion. Melbourne Water who are responsible for the Reservoir advised of problems with maintaining the Reservoir water levels, dam wall, slipway and outlets with a proposal to reduce water level by approx. 6 metres. An information meeting was held at Upper Beaconsfield with representatives from Melbourne Water, Cardinia Environment Coalition, Beaconsfield Reservoir Nature Reserve management and friends group. 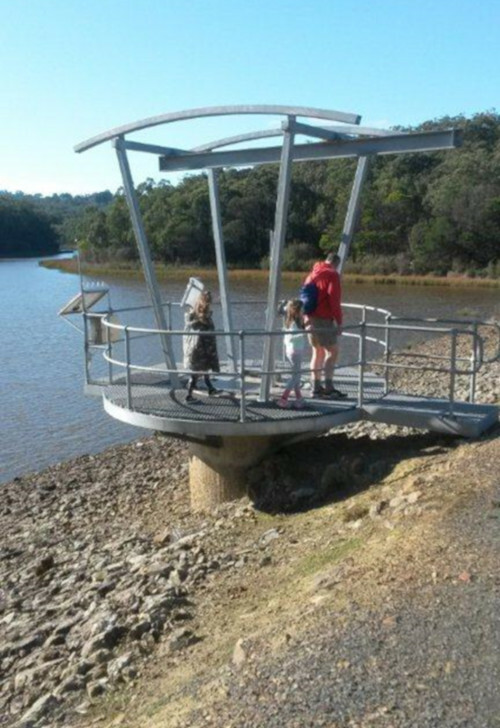 Open days have been held and it is hoped that the proposed redevelopment of the reservoir wall and future plans for the Reserve will allow more accessibility for the community to enjoy this former reservoir for the Mornington Peninsula. Come along on Tuesday 16 October to hear about this beautiful Reserve.